It’s been a busy few weeks here in Washington – and I’ve been fighting from the time I wake up in the morning to the moment my head hits the pillow. But I did take a little time in between snowstorms in Massachusetts this weekend to bake my heart-shaped cake. My mother was born on February 14, and she loved her special connection to Valentine’s Day. I still have a stack of valentines that my daddy gave her, back when they were teenage sweethearts. When I was a little girl, I bought some heart-shaped pans at the dime store. 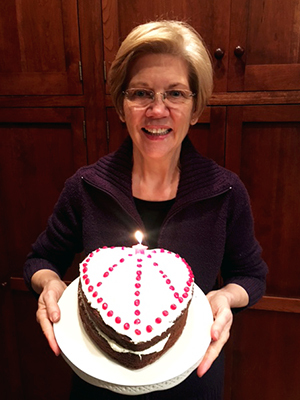 Every year, I baked her a birthday cake. Decades later, when my mother was 83, seemingly strong and healthy, she needed to have some minor surgery – and everything went fine. The teenage nieces and nephews took her on wheelchair races down the hallways, and we all laughed and had juice and cookies. We went home that evening expecting her to be released from the hospital the next day. In the middle of the night, my brother called. He said Mama was dead. Daddy had been sitting with her when she leaned forward and said, “Don, there’s that gas pain again.” Then she died. The autopsy showed that she had advanced heart disease – never diagnosed, and never treated. No one had any idea. Heart disease is the #1 killer of women – causing 1 in 3 deaths every year. No longer considered just a “man’s disease,” doctors do a much better job screening and treating women for cardiovascular disease than they did when my mother had her heart attack. But let’s be clear: We cannot stop heart disease in women if we don’t have regular access to quality, affordable healthcare. That’s why I’m fighting – with all my heart – to stop Republican efforts to repeal the Affordable Care Act. The Affordable Care Act gives women (and men) access to free annual wellness exams to detect and monitor heart disease. It allows heart attack survivors and others diagnosed with a heart condition to get insurance despite their pre-existing condition. It prevents insurance companies from charging people different premiums based on their health status, or charging women more for their insurance than men. It removes the lifetime coverage caps for people with serious or chronic illnesses. And it has expanded Medicaid access in Massachusetts and across the country so millions of people can get the care they need to stay healthy. I still have my heart-shaped pans – and even though my mother is gone now, I still bake a heart-shaped cake every Valentine’s Day to remember her. But this year, I’m doing something more: I’m fighting to make sure everyone’s mother, grandmother, daughter, sister, wife, partner, friend and neighbor can get the health care they need to live longer, healthier lives. Fighting for the Affordable Care Act seems like the right way to celebrate the people you love.